The Italian equivalent to a slushy, granita, a Sicilian cousin of Italian ice is a semi-frozen shaved or scraped dessert made with sugar, water and other flavorings. It has a texture that varies from coarse to smooth (depending on the region), whereas Italian Ice is more sorbet-like in texture (freezes while being mixed, like ice cream). My version of this icy Italian treat features fresh watermelon, strawberries, lime and an unlikely pairing that makes a delicious topping to drizzle on top. 1. Dump the watermelon, strawberries, lime juice and sugar into a blender and mix until smooth. Pour the blended mixture into a fine mesh sieve; this will take out any fruit that did not blend and prevent it from having a sandy texture due to the watermelon. 2. Pour the liquid into a 13×9 glass baking dish, cover with plastic wrap, and place into the freezer. Check every 25-30 minutes and scrape/break up ice crystals with a fork. Repeat this process until the granita is snow-like and fluffy in appearance. 3. Mix the sweetened condensed milk with the balsamic vinegar. Scrape and scoop the granita into small bowls or dessert glasses. 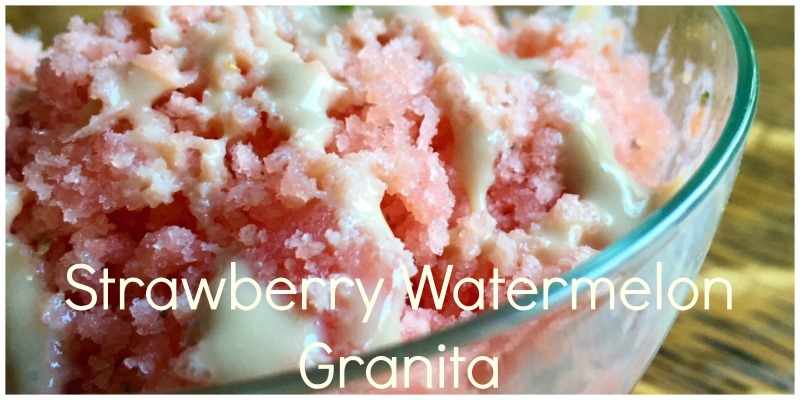 Drizzle the condensed milk over the granita and enjoy! Tip: If the condensed milk is too thick to drizzle, add a tiny bit (no more than a tsp.) of warm water or milk to thin it out. That balsamic drizzle is some next level stuff. Shoutout to the can of leftover condensed milk in the fridge that made it possible. If you try this recipe, let me know what you think!